Green lights, angling toward a vanishing point, dot the stage like a series of city high-rises. A lone figure walks out. A blast of fog emanates from the floor. With the touch of his hand, music begins—a whole note sustained for several bars until a drum machine pounds out a beat. And then, the crisp rip of synthesizers rises above the groove. Kirk O’Riordan, associate professor of music, fell in love with synth-pop bands, like Depeche Mode and New Order, as an eighth-grader. However, he still has a love/hate relationship with pop. 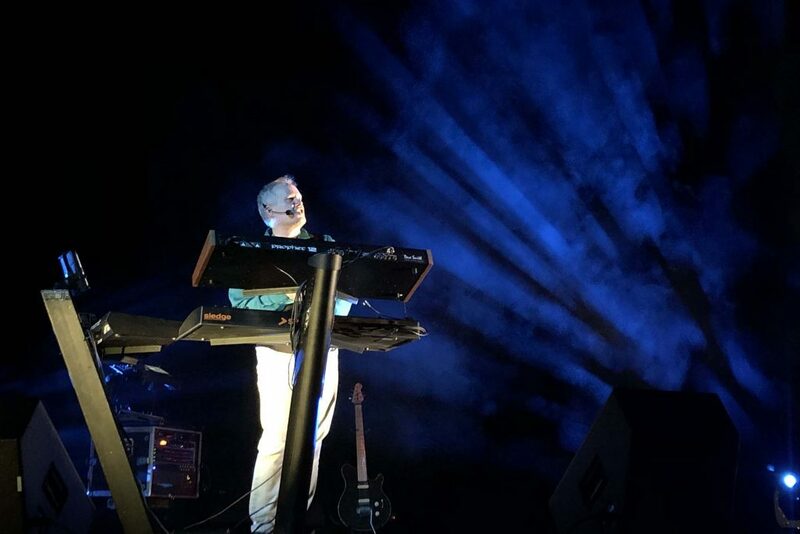 But jamming out to his own ’80s-inspired synthesizer music is something he’s wanted to do for years. 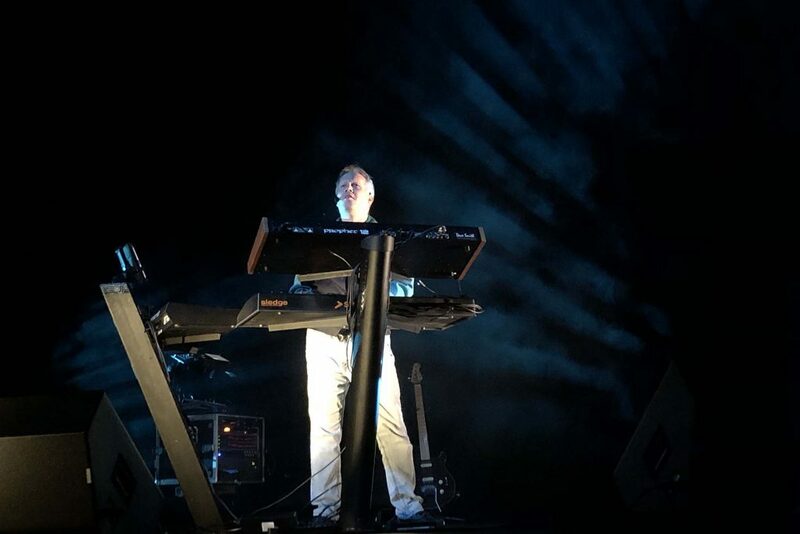 While he played a few faithful covers of some ’80s hits, most of the music was from his 2018 release, Superconductor, an album of classically inspired pop music for synthesizers. His idea was to take all that he has learned as a classical composer and put it in pop styles. This exercise of seeing what he could do with the music style was coupled with some new post-production recording techniques. “I am conversant in recording technology, so I composed, orchestrated, and recorded this album quickly, but it took a long time to polish as I sat at the computer mixing, balancing, and fading,” he says. He spent many hours at the mixing board, refining the sound in order to learn how to use this technology for his more regular compositional practice. It was clear he loves talking, making, and performing the pop stuff, but the point of the concert was for him to learn, to develop his programming and production skills so that he could write better original music. “I have to continue to improve my own skills. If I don’t, I can’t really ask my students to improve their skills,” he says. So taking the risk was essential to him. He took risks, singing essential ’80s songs with one finger pointing in the air. Red lights, patterned like a brain, stretched their neurons around the performance space as he played. “Every aspect of this performance demanded my preparation, commitment, and focus,” he says. That commitment was loud and clear.